SL 61 MkIII | Focusrite Audio Engineering Ltd.
It´s probably the best way to centralize hardware and DAW control. My only complain is the feeling that some crucial features (song mode, sysex, midi merge) were left for updates. I'm just learning everything it does and for me its all about 1 thing.... NO AUTOMAP! I am glad that is gone. Note: Maximum power consumption is required to be screened onto the product next to the power jack and must be consumption and not the specification for the power supply. Format is to the nearest 100mA. Up to 900 write in mA, above 1000 write 1.1A, 1.2A etc. SL MkIII is the centrepiece that can be used to control your whole studio, working perfectly alongside your DAW. Make working with your hardware easy and creatively rewarding, and construct your next production in the 8 track polyphonic sequencer, with everything staying in sync. Your choice of music software is crucial to your creativity. SL MkIII's pads, buttons, eight faders and eight knobs take control of all major music software using InControl. SL MkIII also works with any HUI-compatible DAW. The SL MkIII has an exceptionally high scan rate of 10kHz (10,000 times per second), giving the keyboard a huge dynamic range for expressive keyboard performance. 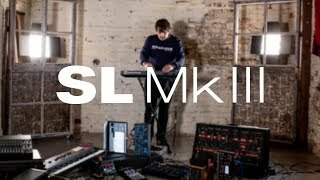 The SL MkIII boasts our finest, most playable and expressive synth-style semi-weighted keybed, with a sprung action and our highest scan rate, all tuned to the needs of the experienced player. It's got aftertouch too, assignable to anything. The Velocity Curves come to you from a Novation engineer who's been designing and playing keyboard controllers for two decades. Choose from a comprehensive selection of Velocity Curves to suit your playing style. SL MkIII's velocity-sensitive RGB pads have multiple functions: they can be used for launching clips, as steps in the sequencer, they are perfect for the finger drummer, and have polyphonic aftertouch. Pitch and Modulation wheels have RGB LEDs that change colour to show what track you're working on. Brightness gives you the value of what you're changing. Components allows you to backup and restore your templates and sessions in the cloud, enabling access from anywhere in the world. All content can also be saved locally.